Engrossing, lyrical, and suspenseful, The Scent of Rain and Lightning captures the essence of small-town Americaits heartfelt intimacy and its darkest secretswhere through struggle and hardship people still dare to hope for a better future. For Jody Linder, maybe even love. One beautiful summer afternoon, from her bedroom window on the second floor, Jody Linder is unnerved to see her three uncles parking their pickups in front of her parents houseor what she calls her parents house, even though Jay and Laurie Jo Linder have been gone almost all of Jodys life. What is this fearsome thing I see? the young high school English teacher whispers, mimicking Shakespeare. Polished boots, pressed jeans, fresh white shirts, Stetsonsher uncles suspiciously clean visiting clothes are a disturbing sign. The three bring shocking news: The man convicted of murdering Jodys father is being released from prison and returning to the small town of Rose, Kansas. It has been twenty-six years since that stormy night when, as baby Jody lay asleep in her crib, her father was shot and killed and her mother disappeared, presumed dead. Neither the protective embrace of Jodys uncles nor the safe haven of her grandparents ranch could erase the pain caused by Billy Crosby on that catastrophic night. Now Billy Crosby has been granted a new trial, thanks in large part to the efforts of his son, Collin, a lawyer who has spent most of his life trying to prove his fathers innocence. As Jody lives only a few doors down from the Crosbys, she knows that sooner or later shell come face-to-face with the man who she believes destroyed her family. What she doesnt expect are the heated exchanges with Collin. Having grown up practically side by side in this very small town, Jody and Collin have had a long history of carefully avoiding each others eyes. Now Jody discovers that underneath their antagonism is a shared sense of loss that no one else could possibly understand. As she revisits old wounds, startling revelations compel her to uncover the dangerous truth about her familys tragic past. Until she was twenty-six, Jody Linder felt suspicious of happiness. Engrossing, lyrical, and suspenseful, Nancy Pickard's The Scent of Rain and Lightning captures the essence of small-town Americaits heartfelt intimacy and its darkest secretswhere through struggle and hardship people still dare to hope for a better future. The Scent of Rain and Lightning revolves around the theme of revenge. What does this novel tell us about the nature of revenge? I love a good story. Even more, I love a good mystery. But, I confess, I'm a snob. Not only do I expect a page turner but also a novel that is well-written, an intelligent endeavor that anticipates intelligent readers. Nancy Pickard's The Scent of Rain and Lightning fulfills my expectations. This novel wraps a plot of twists and turns around characters that are alive with complications and nuances. These characters are themselves a collection of stories, embodying the good and evil that exists in all of us. The plot weaves its way across the pages as electrically as the storms that advance towards Rose, Kansas, bearing with them the heat of passion, the violence of revenge, and the rains of love. I have not read Pickard before, but I'm on the way to the library for more! (Becky M) (Reviewed by BookBrowse First Impression Reviewers). Nancy Pickard ... has written so many first-rate mystery novels (19 so far) that publication of a new one might seem like an occasion for ho-hum. The Scent of Rain and Lightning is anything but ho-hum. Set in a fictional remote Kansas ranching town, it is a "literary" novel in every sense of that word. Well-plotted, clearly written mystery novels are always welcome. A novel that simultaneously qualifies as a gripping read, a master character study and as literary is more than welcome — it is exceedingly rare. Riveting and dynamic, this moving novel will have readers enthralled from beginning to end. Starred Review. Pickard shows her storytelling skills, weaving elements of deception, revenge, and romance into a novel with full-bodied characters who deal with tragedy as best they can; Annabelle Linder’s encounter with Crosby’s wife is particularly moving. From an award-winning author, this is engrossing fiction with an eminently satisfying denouement. Starred Review . . .a worthy successor to the author’s much-acclaimed The Virgin of Small Plains. Pickard’s superb storytelling transports the reader into the characters’ world, making all too real their dilemmas, their choices, and their willingness to believe the unlikely. Highly recommended. 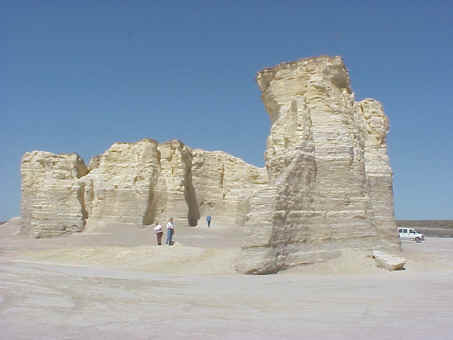 Nancy Pickard says that the fictional Testament Rocks in The Scent of Rain and Thunder are based on Monument Rocks located in Gove County, Kansas, a few hundred miles west of her home in Merriam, close to Kansas City. Set in the high plains, Gove County is cut through from west to east by a deep valley caused by the Smoky Hill River, and is lined with geologic splendors such as Castle Rock and Monument Rocks (pictured below). Sterling is a small, ordinary New Hampshire town where nothing ever happens -- until the day its complacency is shattered by a shocking act of violence. In the aftermath, the town's residents must not only seek justice in order to begin healing but also come to terms with the role they played in the tragedy.